ATK XM25 “Game-Changer” Semi-Auto 25mm Airburst Grenade Launcher/Individual Airburst Weapon System (IAWS) Goes to Combat: DR Provides the Cool Skinny on this Potentially Revolutionary Infantry Weapon System. | DefenseReview.com (DR): An online tactical technology and military defense technology magazine with particular focus on the latest and greatest tactical firearms news (tactical gun news), tactical gear news and tactical shooting news. ATK XM25 “Game-Changer” Semi-Auto 25mm Airburst Grenade Launcher/Individual Airburst Weapon System (IAWS) Goes to Combat: DR Provides the Cool Skinny on this Potentially Revolutionary Infantry Weapon System. It’s now DefenseReview’s understanding at present that the first XM25 combat testers will be “a line infantry battalion in the 101st Airborne division serving in Afghanistan” (thanks Kit Up! ), i.e. the Screaming Eagles, not U.S. Army Special Forces (SF) operators, like we’d previously been told. The XM25, if it works as advertised, would give U.S. infantry warfighters/soldiers a paradigm-shift-level/”game-changing” combat capability that they currently don’t enjoy, thanks to the XM25’s precision-defilade capability provided by its Counter Defilade Target Engagement (CDTE) system, consisting of the weapon itself, a “fully-integrated” L-3 Brashear XM104 ruggedized Target Acquisition and Fire Control (TAFC) system (with targeting laser for measuring distance to target), and time-fused High Explosive Airburst (HEAB) 25mm projectiles (genades) that explode in proximity to the target (above or beside the target), instead of via a kinetic strike. 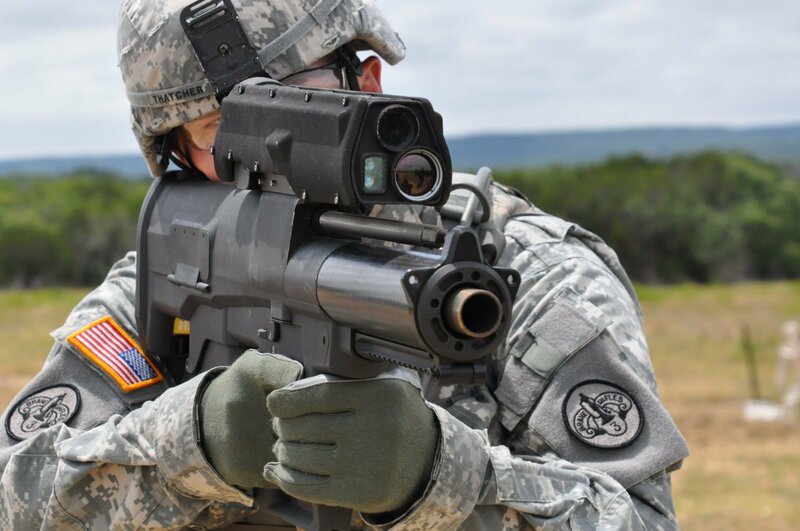 The XM25 is essentially a box magazine-fed semi-auto 25mm grenade launcher capable of firing 25mm HEAB rounds accurately up to a reported distance of 2,300 ft. (approx. 767 yards). XM25 magazine capacity is 4 rounds. The XM-25’s High Explosive Airburst/defilade capability means that U.S. military warfighters/soldiers can engage enemy combatants fighting from behind walls, from trenches, or from inside buidings. “It’s giving them the edge,” Lehner said, in the Afghan AO (Area of Operations)/combat environment where the enemy employs the centuries-old, oldie-but-goodie infantry combat tactic of popping up suddenly from behind cover, firing at us, and then disappearing again. “Now we’re taking that away from the enemy forever,” Lehner says. 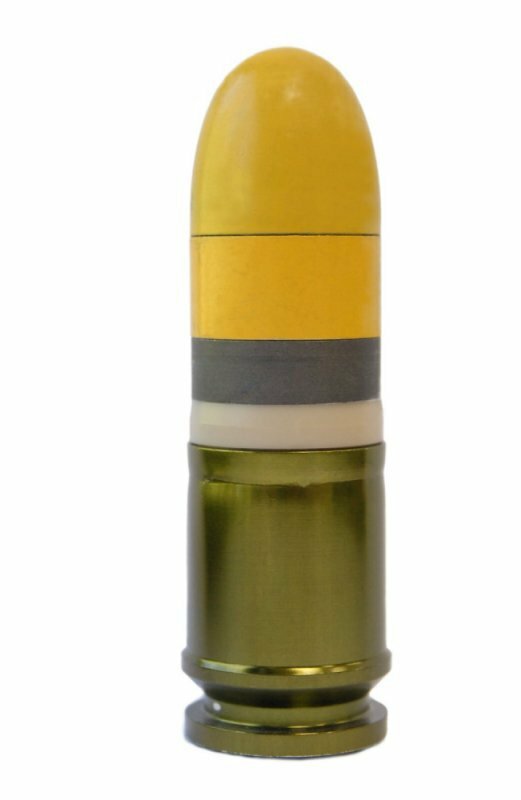 The Army is also developing an armor-piercing/armor-penetrating (AP) 25mm grenade round that DR presumes penetrates the hardened target and detonates on the other side of the barrier, once said penetration is achieved. Here’s how the XM25 fire control/targeting system works: Put the reticle on the target, push the lase button, realign the adjusted aim point on the target, and fire. “The range is automatically communicated upon firing to the chambered 25mm round, and stored in the fuse logic. Upon muzzle exit, the intelligent fuse, using a turns-counting approach, determines the distance traveled, and bursts precisely over the the engaged target at the programmed range. 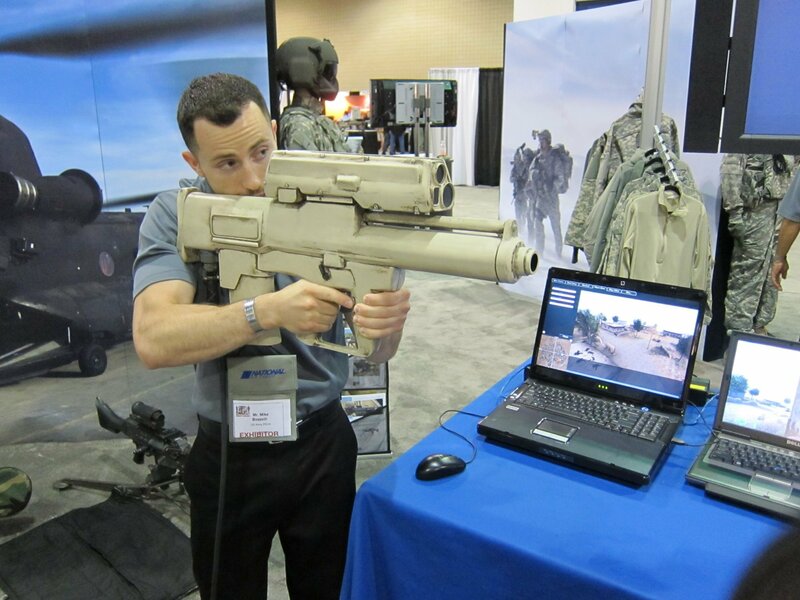 Thanks to Mike Bozzelli, PEO Soldier, Defense Review got the opportunity to test the XM25 training weapon/simulator system ourselves this past June at the 2010 Special Operations Forces Industry Conference (SOFIC 2010), and it was really fun. DR was able to neutralize, i.e. annihilate, multiple enemy targets with relative ease, with very minimal instruction/training. If a little enemy combatatant showed himself, he was dead in seconds, no muss no fuss, just how we Americans like it. DefenseReview has been observing the XM25 program since before we first wrote about it in May 2005, so it’s nice to see the weapon actually get fielded. It’s our understanding that the primary challenge the development team had to overcome was to make the 25mm HEAB grenade round reliable and safe. 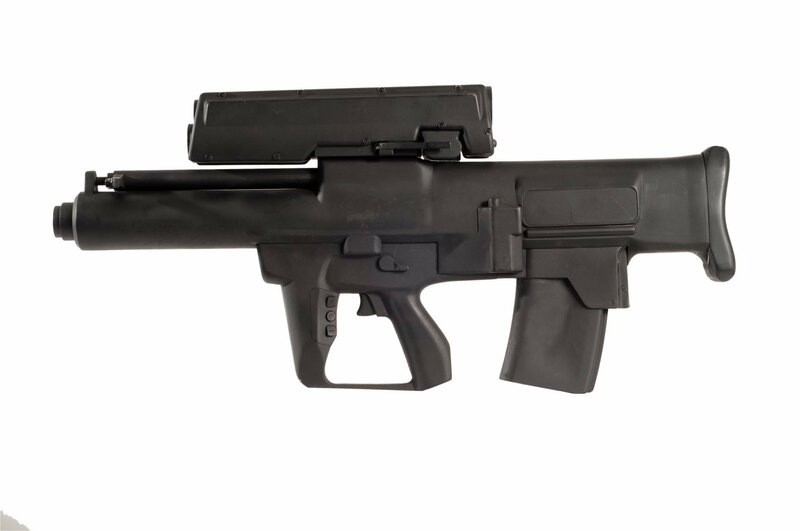 Before becoming the XM25, the weapon was the XM29/OICW (Objective Individual Combat Weapon) that combined a 20mm grenade launcher with a Heckler & Koch (HK) G36/XM8-type 5.56x45mm NATO (5.56mm Nato)/.223 Rem. undermounted assault rifle/carbine/SBR (Short Barreled Rifle) component. The XM29/OICW was too large and heavy to be practical, and the 20mm ammo wasn’t lethal enough. So, the military separated the two weapon elements out, made the grenade launcher a dedicated weapon (something DR applauded), and increased the launcher/grenade caliber to 25mm (something DR also applauded), thereby increasing lethality. While some may argue that the 25mm is still lethality-challenged, it should theoretically be lethal enough to get the job done, as long as the XM25 weapon system (weapon AND ammo) works as advertised. If it does, ATK and the U.S. Army will have successfully turned a lump of coal (XM29/OICW) into a diamond (XM25). What really perked DefenseReview’s ears up about the XM25 was a recent conversation we had with one of our U.S. Army SF (Special Forces) contacts who was really enthusiastic about it. He told us that, for SOF forces, the ultimate goal in combat is a one-shot/one-kill scenario for every target you engage, or, as DR would put it, one shot per customer combat capability, even at long range. If the XM25 works as advertised, it will provide SOF forces with just that capability. Our contact agreed that the XM25 is a potential game changer. If the XM25 indeed works as advertised, DR agrees with our SF friend and the U.S. Army at large that it’s potentially a game changer/combat paradigm shifter and welcome addition to the U.S. military infantry combat weapons buffet. Based on the XM25 simulator system/training weapon, it actually makes the precision-defilade enemy target neutralization process fun, and one must never discount the fun factor when weapons are involved. If you can somehow make infantry combat engagements an enjoyable/fun experience for the XM25 end-user/operator, well that’s at least half the battle right there. There’s nothing quite like having a highly-lethal ballistic magic wand with a one-shot/one-kill capability in your hands. Definite morale booster. Listen, war’s difficult enough. U.S. military operators should at least be able to enjoy their work. And frankly, if you can’t at least have a modicum of fun vaporizing hostiles, what’s the point? Besides, boredom kills in combat. One of the potential negatives DefenseReview can see immediately are the respective weapon and ammo costs, which may prove to be somewhat problematic, considering current U.S. economic realities. 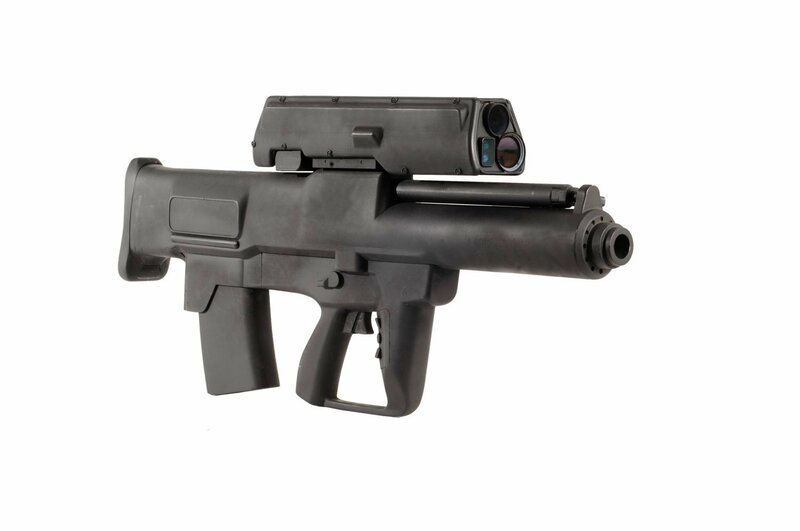 The weapon incorporates advanced, high-tech composites like carbon fiber in its construction, and these materials aren’t cheap. Advanced fire-control systems and time-fused airburst rounds also aren’t exactly inexpensive. The reliability and combat durability of the XM104 fire control system’s and 25mm grenade ammunition’s respective electronics is also in question. Finally, the military procurement effort will also have to deal with the usual obstacles to fielding a new weapon system and ammunition type and the obvious challenge of manufacturing/producing the weapon (XM25), fire-control system (XM104), and 25mm HEAB ammo at the required schedule and QC (Quality Control) level. Update: DefenseReview just found out from Christian Lowe at Kit Up! that there are currently five (5) XM25s in combat, and the goal is to field a total of thirty-six (36) XM25s as fast as they can, at a cost of $10 million ($10,000,000), all in. That comes to $277,777.78 cents per weapon! Wow. Ouch!! Sure hope the damn thing works! The Army wants to produce and field 12,500 XM25’s, starting in early 2014. That’s enough for one XM25 system per general infantry squad and Special Forces team. Let’s just hope the Army can get the per-unit production cost WAAAYdown, given the much larger quantity. There have been numerous stories in the media lately covering the XM25’s forward operational assessment in Afghanistan. We wanted to provide an update on PEO Soldier LIVE with the facts. The Army is currently conducting a forward operational assessment of the XM25 Counter Defilade Target Engagement (CDTE) System in Afghanistan. Prototypes arrived in theater in Afghanistan in November. Project Manager Soldier Weapons personnel conducted new equipment training with select units and are monitoring the use and performance of the systems during the assessment period. The prototype weapons are being carried actively on patrols, and in various combat outposts. Soldier feedback at this stage will allow the Army to make engineering refinements to the system and will assist the Army in making future decisions regarding budget, tactics, basis of issue, and other improvements Soldiers want to see in the weapon system. The next phase for the XM25 program is to build a large quantity of production representative weapons and ammunition in 2011 to deploy into Afghanistan for further combat assessments. Finally, with testing complete and Army approvals in place, 12,500 systems will be produced and issued beginning in early 2014 – enough to support one per infantry squad and Special Forces Team. For centuries, combatants have been trained to protect themselves from direct fire by seeking cover behind a rock, tree, wall, trench, or anything that could stop a projectile. Soon this rule will no longer apply. The XM25 removes an enemy’s protective cover because it fires a High Explosive Airburst (HEAB) round that can be programmed to detonate at precise distances past the cover and next to the enemy. The HEAB round also has a point detonation capability so whether the enemy is behind cover or in the open, they can be neutralized. The introduction of the XM25 is akin to other revolutionary systems such as the machine gun, the airplane and the tank, all of which changed battlefield tactics. No longer will our Soldiers have to expose themselves by firing and maneuvering to eliminate an enemy behind cover. Our Soldiers can remain covered/protected and use their XM25 to neutralize an enemy in his covered position. This will significantly reduce the risk of U.S. casualties and change the way we fight. Finally, the system is less expensive, more precise, quicker to deploy, and causes less collateral damage than mortars, artillery or airstrikes. This makes the weapon especially valuable in Afghanistan where protecting the lives and property of the civilian population is critical while defeating the insurgency. 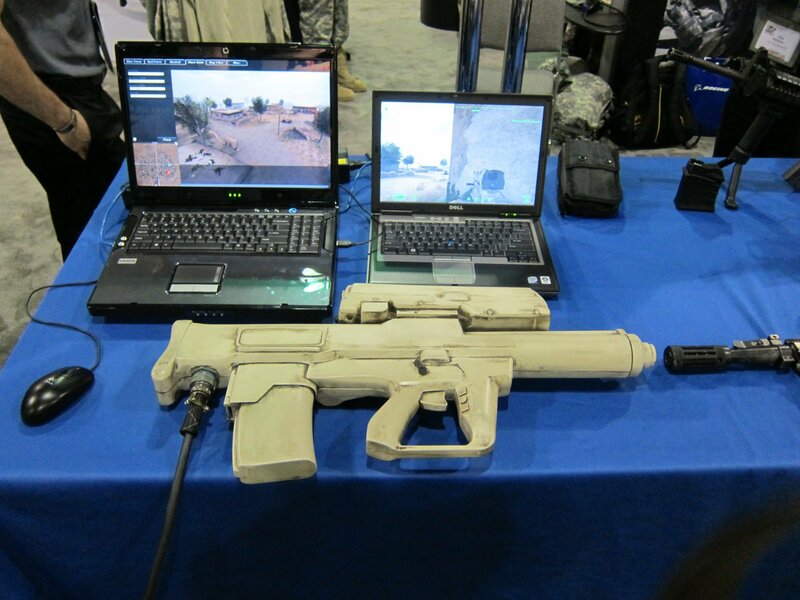 For more information on the XM25, you can download a factsheet or read my article, “Nowhere to Hide — A ‘Smart’ Individual Weapon System for the Soldier,” which features information on how the system works in a battlefield scenario. An American patrol nears a walled, Afghan village when an enemy combatant looks over the wall and fires his AK-47 rifle at the oncoming U.S. Soldiers. The Americans return fire with their rifles and maneuver, but find it difficult to neutralize the enemy rifleman who repeatedly exposes himself for only a second, shoots, then ducks behind the thick wall. At this time, the patrol leader calls for the XM25 gunner to take action. Immediately, the XM25 gunner aims the laser range finder at the top of the wall where the enemy last ducked down. The gunner presses the laser range finder button on the front of the XM25’s trigger guard and records a distance to the wall of 451 meters. The distance is displayed on the TAFC’s optical lens along with an adjusted aim point, or “cross hair,” to help the soldier better aim the XM25. This adjusted aim point takes into account air pressure, temperature, and the ballistics of the 25mm round for the given range of 451 meters. The soldier then uses the increment button on the trigger guard and adds one more meter to the firing solution since the enemy combatant is approximately a meter behind the wall. Click here to visit PEO Soldier’s XM25 info page. ATK/HK XM8 Carbine Feedback/Update and ‘Army Times’ XM8 Article Archive.